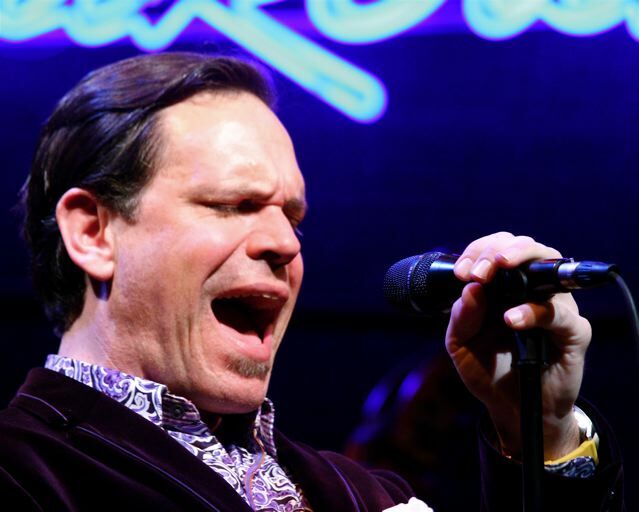 A blow-by-blow for Kurt Elling fans and others who plan to catch the band on their latest tour. (By “others,” I mean those who haven’t yet seen Elling live, because once you do, you’re a fan.) 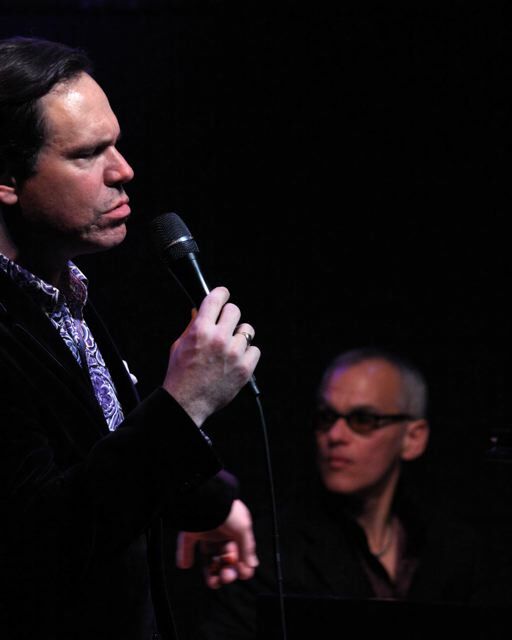 This tour is mostly about The Gate, the new CD produced by Don Was and the successor to Dedicated to You: Kurt Elling Sings the Music of Coltrane and Hartman, for which Elling won his long-overdue first Grammy in 2010. But it’s not just about The Gate. Here are the setlists and remarks along the way. “Steppin’ Out” (from The Gate, 2011). A burst of energy and a big mood shift. In live performance, this Joe Jackson tune gets extras: scatting from Elling, stretch-out solos from Hobgood and Owens. It’s early in the set for a drum solo and a reminder to keep a close watch on the terrific Owens. “Dedicated to You” (from Dedicated to You, 2009). A speedier, more swinging and upbeat version than heard on the album (which featured the string quartet ETHEL). Elling leaps into falsetto and the crowd loves it. Hobgood’s arrangement makes this a very different tune than the one recorded by Coltrane and Hartman. “Samurai Cowboy” (from The Gate, 2011). Elling starts with a bit of beatboxing (Carnage in the house? 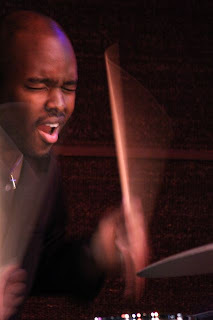 ), then engages in a dialogue with Owens and his drums. No background vocals (bum-dum-dum, shh-shh-shh), as on the album; just the two of them, playfully sparring. At one point, Elling wipes the mic back and forth on the lapel of his chocolate velvet jacket. Later, he makes motor noises and zooms around the stage. Elling’s lyrics (to an original tune by bassist Marc Johnson) are witty, twisted, and hip, and he acts them out with relish. This is a good-time song with a lot of room for invention and interpretation, and everyone makes the most of it. “Norwegian Wood” (from The Gate, 2011). Guitarist John McLean joins the band for this reinvention of the Beatles tune and contributes a fiery solo. New sound, new energy. Interestingly, Elling makes a slight but significant change to the original lyrics (in live performance and on the recording): “I crawled off to sleep it off in the bath.” For meaning, or for rhythm? “Matte Kudasai” (from The Gate, 2011). On his website, Elling writes about this King Crimson song: “'Matte Kudasai’ is the Japanese phrase for ‘please wait.’ There is an indeterminate poetic flavor about that composition that has always stayed with me and been relevant to me.” Ever since I first heard it, this song has been stuck in my head. In performance, it’s even more beautiful, with Owens on soft brushes. “Golden Lady” (from The Gate, 2011). In live performance, Elling scats, has a musical conversation with McLean, growls, and scales the falsetto heights. The crowd goes wild. “Tanya Jean” (from The Messenger, 1997). Starting with this tune—music by Donald Byrd, solo by Dexter Gordon, rapid-fire, tongue-twisting lyrics by Elling—was like wearing a sandwich board saying THIS IS A WHOLE NEW SET. This was the Elling many of us had come to see, the one who sings Coltrane’s “Resolution” and Dexter Gordon’s version of “Body and Soul” and blows the roof off the venue. 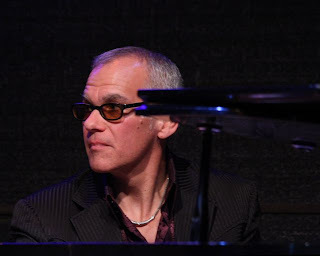 The recorded version is almost entirely sung (with overdubs); last night’s live performance featured a bluesy piano solo by Hobgood. “Nighttown, Lady Bright” (from The Gate, 2011). The last song on the new CD worked well as the second song in the second set. A mood-changer, with a spoken-word section quoted from Duke Ellington’s Music Is My Mistress. “Estaté.” Elling has not yet recorded this lilting love song to summer, a perfect choice for a Minnesota night where temperatures were plunging below zero. McLean comes out early for this one and stays. “The Waking” (from Nightmoves, 2007). A selection from the fine CD that preceded Dedicated to You. (One jazz vocalist has told me that this CD changed her life.) Accompanied only by bass (here, Raghavan; on the CD, Rob Amster, Elling’s former bass player of many years), Elling sings the lovely poem by Theodore Roethke: “I wake to sleep, and take my waking slow.” There’s a man in the audience who seems especially moved by this song; tears run down his cheeks. The crowd is smaller for this set, and so is the room; the Dakota pulls a curtain between its two halves (the bar side and the restaurant side) when the house isn’t full, creating a more intimate space. Elling ends on a deep, low note. Unscripted banter follows, during which Elling riffs (among many other things) about how dry it is when it’s cold, how Mark Murphy would surround himself with humidifiers when he sang, and how he used to think that was crazy but no longer does. Throughout, Hobgood accompanies him on piano. There’s a joke about a flood, and a bit about how “The devil is pulling at the back of your coat—It looks like your best friend—It is,” which introduces the next song. “Late Night Willie.” This has not yet appeared on an Elling CD, though I’ve read it was originally slated for The Gate. I heard him sing it at Gustavus Adolphus College in 2009 (back when “Samurai Cowboy” was called “Kabuki Cowboy”). I hope he records it someday. It’s a fun tune with terrific lyrics: “Unless you’re Miles Davis/There’s always some other/some brother smoother than you…. When you’re finally dead/Earth can be your bed/Life’s a child waiting to be fed.” I like this song a lot. It’s about staying up late, staying out late, making the most of every minute. “Higher Vibe” (from Man in the Air, 2003). I have always loved this song, a Courtney Pine tune with relatively sparse (for Elling) lyrics. It’s a prayer in long-held notes (“Higher viiiiiiiiiiiiiiiibe, live in meeeeeeeeeee”) that ends with this beautiful, uplifting line: “Everyone you know is alive and loved and shining in the mind of God.” McLean solos and all is good, except the sound guy (who roams the room with an iPad) tries an effect that sounds like Elling has something caught in his throat. But “shining in the mind of God” is not a bad sentiment with which to end the night. He makes the word "God" last forever and ever, amen. 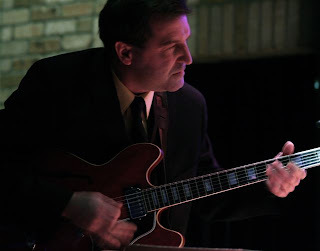 Absent from both sets: "Blue in Green," the limpid, luminous take on the Bill Evans tune. I asked Hobgood if we might hear it on Thursday. He said they hadn't yet worked through it with Raghavan and Owens (on the CD, John Patitucci plays bass; Terreon Gulley and Kobie Watkins share drumming duties). Also missing: "Come Running to Me." But most of the new CD was covered, and we heard plenty from earlier recordings, along with some still unrecorded songs. Based on past experience, I would be very surprised if Thursday's sets mirrored Wednesday's. But I'll let you know. 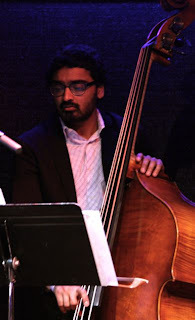 Labels: Dakota, Harish Raghavan, John McLean, Kurt Elling, Laurence Hobgood, The Gate, Ulysses Owens Jr.
We just saw Kurt Elling at Jazz Alley in Seattle, the second set (and he actually referred to doing more interesting second sets). I wasn't too familiar with him before the show but was blown away and am now looking around online for more. Thanks for this detailed info-packed review. Cynthia, the first time is a revelation, and he just gets better. Thanks for reading and writing. Icons Among Us: The whole thing, please?